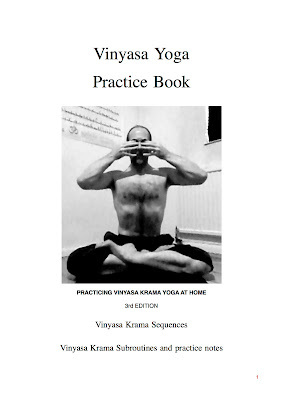 The NEW, 3rd edition, of my Vinyasa Krama Practice Book is now available for FREE download from my Google docs page. 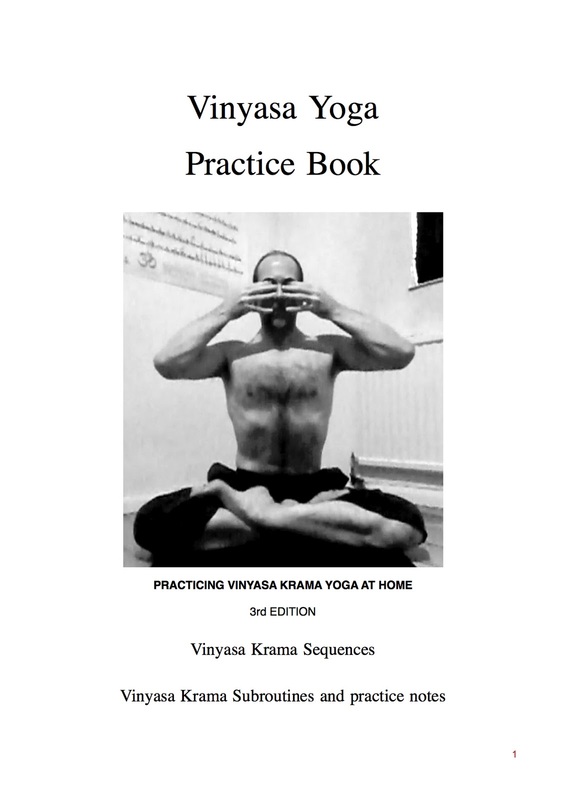 This edition includes practice notes for all of Ramaswami's Vinyasa Krama subroutines Ramaswami was a student of Krishnamacharya for over 30 years). It's still very rough and in need of a complete rewrite to get rid of some of it's 'bloggyness'. It's also inconsistent as the style of the notes have changed over the three months I've been writing them up and posting them here. Plus there's the havoc my mac's automatic spell checker has made of all the yoga terms and names, I'll iron them out, I promise. It is what it is just a series of practice notes, things that came up as I practiced the subroutines each morning. Some of the notes reflect ideas I've picked up in my reading, online, from comments posted here (thank you) and from just working through the subroutines and at the postures. Everything I mention I've tried and have found useful in my own practice, there are of course all kinds of other techniques and approaches that could be included, I'm either not aware of them, haven't tried them out or haven't found them useful for me personally. I've tried to avoid getting too anatomical. There are video's for all the subroutines, for some reason the links don't seem to work in ibooks but if you download it and open in the pdf reader they should work fine (My mistake, seems the links DO work in ibooks although it takes you out of ibooks to watch them). The pranayama and meditation section are the next areas I want to work on, for now they are just a couple of practice sheets. Also, I hope to add practice notes for the Jump back library in the near future. It is of course NO substitute for Ramaswami's own books, The Complete book of Vinyasa Yoga and Yoga for the Three Stages of Life both of which I've gained renewed respect for in the process of preparing these notes. The Complete book of Vinyasa Yoga lays out the breath for every single movement in and out of every posture, in every subroutine, in every sequence, quite remarkable. The Three Stages of Life goes into such depth that I consider it the best book on yoga I've come across thus far. The whole thing has been brought together using Apple Pages. Here's the new table of contents to give an idea of what's in it. Thank you very much for your wonderful and helpful book. Your hard work is much appreciated! Thank You Very much. Very helpful guide.